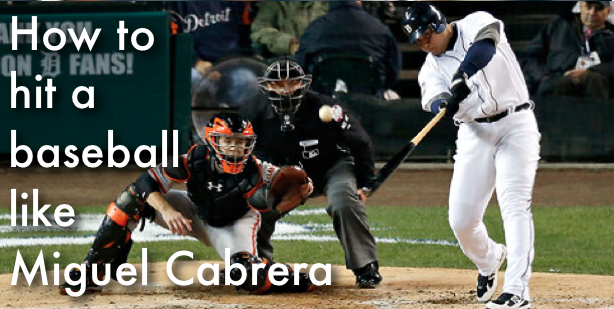 Last year Miggy made baseball history. He was the first person to win the Triple Crown since Carl Yaztremski went on a hitting tear for the Boston Red Sox when he batted .326, hit 44 HRs, and had 121 RBIs back in the late 60’s! THE DUDE WAS A BEAAAASST! So how did Miggy do it? More importantly ,” how did he make it look SO EASY?!!!!”. Well I got your answer. He’s a master at keeping his hips, lower- half, and shoulders closed at the very last second until he explodes on the ball with incredible force. Oh yea, and he also accomplishes this while achieving “minimal head-movement”!!! Yes, he’s established himself as a bonafide big league hitter, but are you going to let his achievements intimidate you? Don’t. I believe you can be just as successful as Miguel if you’re willing to apply the batting tips shared in this next video! Watch this video and apply it in your hitting drills when you’ve mastered the concepts! Did this video help you? Who’s swing would you like to see next? Tell us in the comments box below to earn a chance of winning the book “The Way of Baseball”.